Hyperbaric oxygen therapy (HBOT), also known as hyperbaric medicine, is the medical use of oxygen at increased atmospheric pressure to promote healing. A highly effective treatment recognized by the American Medical Association, hyperbaric oxygen therapy (HBOT) is now available at leading medical centers throughout the U.S. 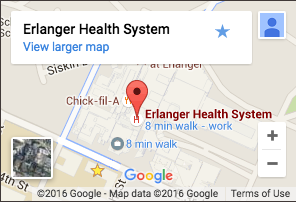 Among them is Erlanger, the only Level 1 accredited Hyperbaric Medicine program in Tennessee. Available for wound and emergency care, our program retains the only certified hyperbaric nurses and technician, as well as one of only 180 physicians nationwide — and the only one in the region — who is board-certified in hyperbaric medicine. Oxygen, when breathed under increased atmospheric pressure, is a potent drug. Erlanger’s HBOT facility features state-of-the-art monochambers and ancillary equipment that ensure the safe and effective application of HBOT. Through this non-invasive and painless regimen, highly oxygenated blood accelerates wound healing by stimulating the body’s own defense mechanisms. The chamber is pressurized with 100 percent oxygen, which is 20 to 30 times more oxygen than we normally breathe. This saturation of oxygen in the body’s tissues promotes new tissue development, increased white blood cell activity, reduced infection rates and edema, and the formation of new blood vessels to promote permanent healing.